New Delhi: UEI Global Education organised its 3rd edition of Le Vitesse2019, spanning over 3 days of national sports event and cultural festival. Thousands of students from all 9 campuses of UEI Global Education across India like Agra, Chandigarh, Delhi, Jaipur, Pune, Lucknow, Ludhiana, Jalandhar and Trivandrum participated in this event. The festival was mélange of the vibrant Indian culture and tradition, where all the students seem to re lived the spirit of ‘unity in diversity’. The three-day youth festival had 2 days of Sports and 1 day Cultural Festival, where total 7 sports were played, including both indoor and outdoor sports such as Cricket, Soccer, Volleyball, Chess, Table Tennis, Badminton and Athletics. Cultural festival includes group dance competition, Jam Session and Gala Night to celebrate the cultural vibe of each state and enhance the celebratory flavor of the day. The winning teams and runner-ups were awarded with certificates, trophies, prize money and medals in each competition of sport and cultural event. On this occasion Chief Guest Mr. Sunil Gupta- CEO of Welcome Heritage Hotels inaugurated the event by lamp lightening. He shared his vision on the education and industry integration and emphasized on the shortage of skilled manpower in the Hospitality Industry. He as strong proponent of skilling focused on the experiential learning enabled with entrepreneurial abilities which can fulfill the industry demands and can take Indian hospitality to its fullest. He further congratulated UEI Global for bridging the gap and skilling students with entrepreneurial abilities. The inauguration ceremony witnessed the presence of Chief Guest Mr. Sunil Mathur- Ex Oberoi, Shereton, and offered a rich experience of more than 4 decades to budding hoteliers. He had worked closely with students through his days with Oberoi School of Hotel Management. He shared his wonderful experience and scope of Hotel Management Education. He interlinked the sports with the personality and development of professionalism in the students. He shared the importance of playing and participating in such events for the overall development of the students and even guided students that even loosing is a grace. His views & insights were valued by all the budding hoteliers present at the event. 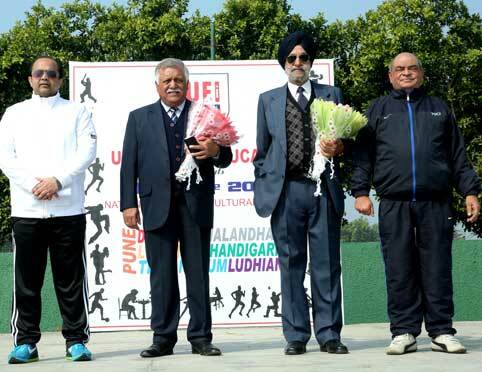 The event was also blessed by the presence of General – Inderjeet Sawhney, ex army officer and father of proud son Lt. Harinder Sawhney, ex-director UEI Global. He was overwhelmed by the energy of all students and guided that “Josh with Hosh” is all what is required to succeed in life. To motivate the students, Manish Khanna, CEO, Said – “Such kind of sports events is very important for the holistic development of the students because this can bring out the enthusiasm, sharing, commitment, team play and inspire for performance and attainment which helps not only in personal space but while progressing in professional achievements. We are glad to showcase on one united platform the varied hues of culture, tradition and heritage to recreate that oneness of Incredible India. We welcome all the students for being the part of “Le Vitesse 2019”.